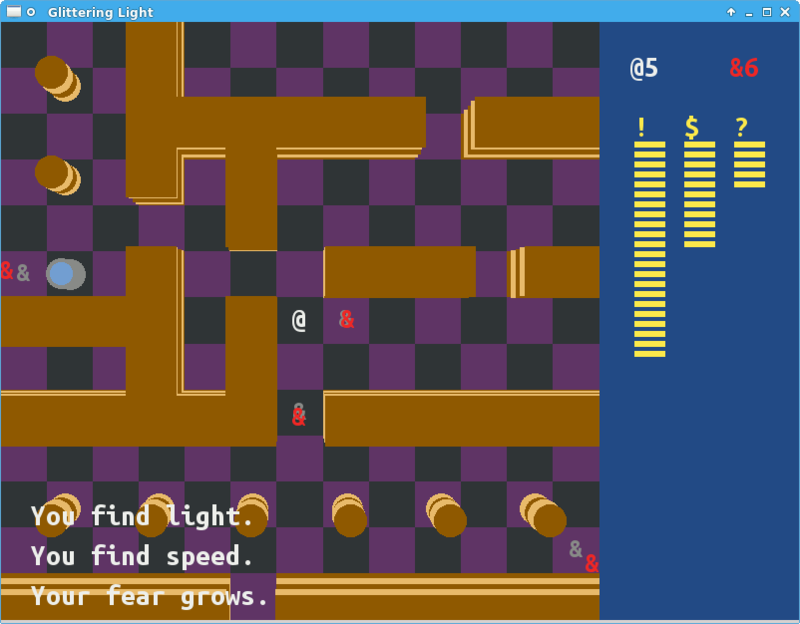 Not depicted: the horrible screen flickering every time you make a move on higher zoom levels; hopefully it will go away on more powerful computers, because clearly double buffering in sdlBasic isn't working the way I thought. But hey, it runs, and looks just fine too. Water is surprisingly nice for such a simple trick, and knowing the exact screen aspect ration enabled me to come up with a nice non-verbal HUD — the minimap is displayed on-demand like in the new online version. Speaking of which, I found a bug in the latter that made speed boosts basically useless by the time you found any. Going to upload a fix soon, along with the desktop port. In other news, this week I found yet another HTML5 library to ease roguelike development. Unlike the competition, rl.js is a single 600-line file, and doesn't try to include the kitchen sink. It handles input, output, tilesets -- including procedural art features -- and manages the map, including collisions. In other words, a focused (and very well documented) product. Only its use of the General Public License is a potential obstacle. Still on the same topic, there's a new roguelike review blog in town, and it might just be worth following for a fresh perspective. And speaking of perspectives, just yesterday I was pointed at an academic, yet quite readable, article on diversity in games with procedural generation. Tl;dr version: the data structures and algorithms we use, even the programming languages, encode biases and assumptions, of which we have to be aware, lest we end up conveying unintended messages. Last but not least, the news surfaced a few days ago of the brand-new Interactive Fiction Technology Foundation, which aims to future-proof certain tools and services the IF community has come to depend on. A most welcome initiative. But I'm over my quota again. Until next week, code mindfully.